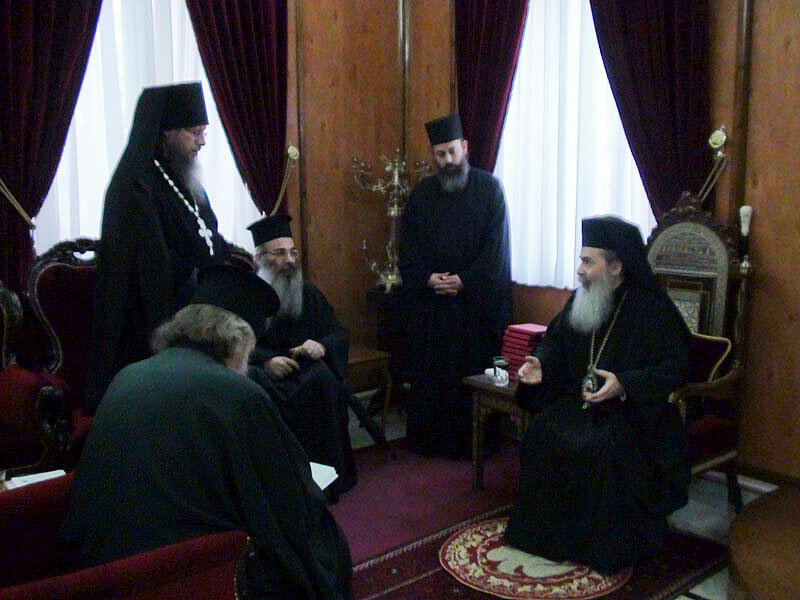 His Beatitude Patriarch Theophilos III Receives the Clergymen of the Russian Ecclesiastical Mission in Jerusalem. On Thursday, December 20, 2012, His Beatitude Patriarch Theophilos III of the Holy City of Jerusalem and All Palestine received Hieromonk Roman (Krassovsky), Acting Chief of the Russian Ecclesiastical Mission in Jerusalem of the Russian Orthodox Church Outside of Russia and its other clergymen. Fr Roman told His Beatitude about the life of the Mission and the Liturgical life of the Holy Ascension Convent on the Mount of Olives, the Russian Convent of St Mary Magdalene in Gethsemane, and the Skete of St Chariton in Wadi Fara, as well as St Alexander Nevsky Church in the “Russian Excavations,” the Orthodox School of Bethany and the Mission’s work to the glory of God and the benefit of the Russian Church Abroad. His Beatitude invoked Divine blessings upon Fr Roman and his fellow clerics, blessing the Mission’s monastics to participate in divine services in the Life-Bearing Sepulcher of the Lord and giving each a memento of their meeting.